It's getting cold at home and four days isn't long enough for the Caribbean, what's the next closest place? 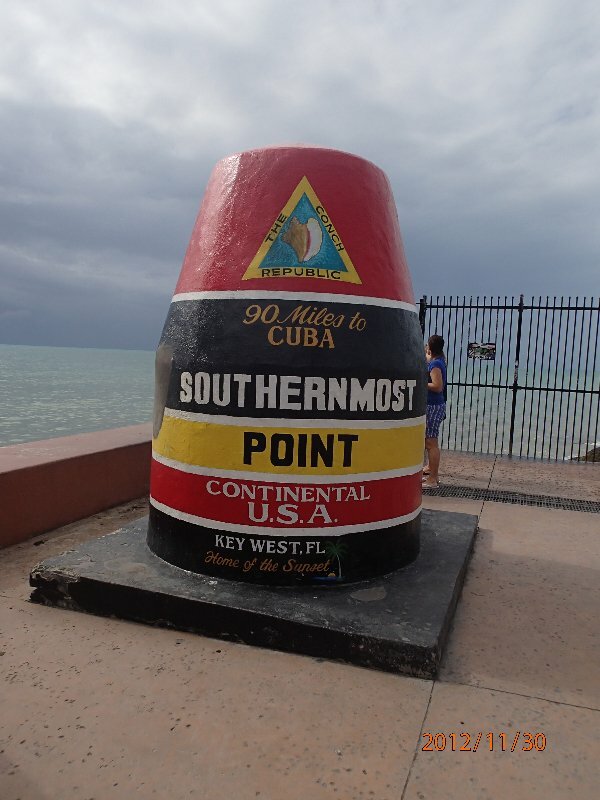 None other than Key West. Snorkel gear packed and I'm heading south. "It's a short runway, we are in a big bird, we'll be touching down hard and stopping fast," says the captain of flight 3210. He was not kidding! But before that even happened, my adventures had started. 1. For 55 minutes from Tampa to Key West, the seat next to me was occupied by none other than the loving wife of Cowboy Charters. She did a great job convincing me to take a full day fishing trip on their 36' Hatteras in search of marlin and tuna. I would consider. At the time, I had nothing planned for Friday. I checked in at one of the nicest Doubletree's I've stayed in. I really wanted to stay in some little bed and breakfast close to Duval, but when you are traveling on points, you can't be too picky. Either way, it's a nice hotel and offers free shuttles to downtown and airport pickup and it was my home away from home for the next 4 days. Unpacking to me means unzipping the suitcase, pulling out my trusty day pack and packing it with camera, notebook, odds and ends of other little stuff and a book to read (just in case I get to feeling unsociable). First stop, Sloppy Joe's. You cannot go to Key West without stopping at this iconic bar. No longer in it's original location (that would be where present day Captain Tony's is), you can have a drink where Hemingway used to party. Try the Mile Marker Zero Pale Ale, it's pretty tasty. The story is that in 1937, the rent was going to increase in the original location and Joe Russell refused to pay. He did what any bar owner would have done, asked all his patrons to grab their drink and anything that wasn't nailed down and move to a new location. More on this move a little later, there was something that was sort of nailed down that ended up in a rather interesting location. The rest of Wednesday involved meeting random people at a couple of different bars, talking, cinnamon whiskey shots and lots of laughter. Although I travel alone, I very rarely find myself alone. 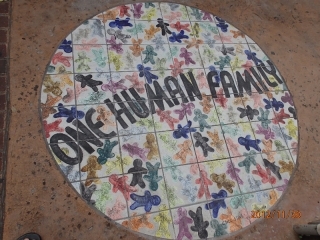 People are friendly (usually) because we are "One Human Family". There was one small group of 6 that I ran into multiple times during the evening, each time, we had to celebrate the reuniting with another shot. Lucky for me, my last stop was only 1/2 block to the hotel shuttle pickup location, that was the longest 1/2 block I think I've ever walked stumbled. 2. Thursday was adventure day to be spent under the sea, or floating on top of it. I originally had three separate snorkel trips booked, the first morning snorkel, however, did not have enough people signed up to go out. Lucky for me, there were options. 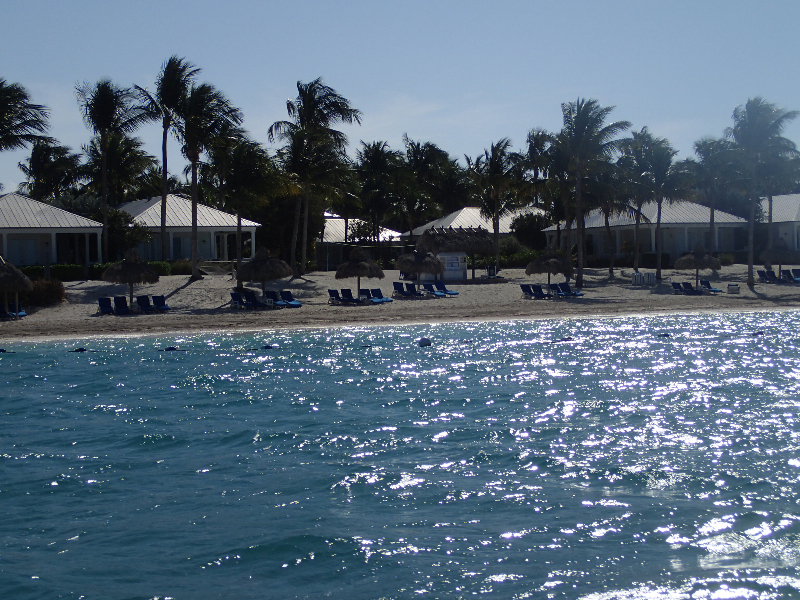 A quick change in reservations by the most accommodating staff at Fury and I was heading out on an Island Adventure. All trips start with the debriefing, how to use the head, safety, itinerary, etc. and every boat I've been on includes the most important safety tip of all, "If you see the crew put on a life vest and grab a bottle of rum, do the same." As we left port, the captain received reports that the reef had 3-4 foot seas and would be too rough to snorkel in plus low visibility. We opted for an area known as The Lakes which has some coral growth, but mostly sea grass and a depth ranging from 5-30 feet. It' a group of grassy flat banks that completely encompass a shallow lagoon. 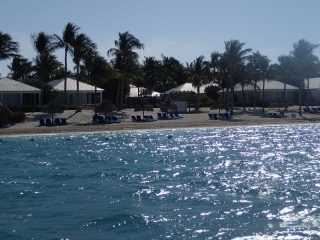 The lagoon runs from Mule Key to Boca Grande Key and visibility is generally good. The water, although calm, was still a little rough so I only stayed in about 45 minutes. Unfortunately, I was not able to get any good photos this trip, but I did see a couple of nurse sharks and plenty of sting ray. I also learned that the nurse shark is one of the few sharks that can respire while stationary by pumping water through their mouths and out gills. This allows them to play the sit and wait game, I love interesting facts! 3. After lunch it was into the ocean kayaks. I've never done this before and was a little nervous. I was paired with John, the odd man out in a group of 3 (there were only 6 of us plus 2 crew, so it was a very cool social experience as well, and lots of eco educational fun facts from the crew). Our guide filled up a cooler full of beer and off we went. 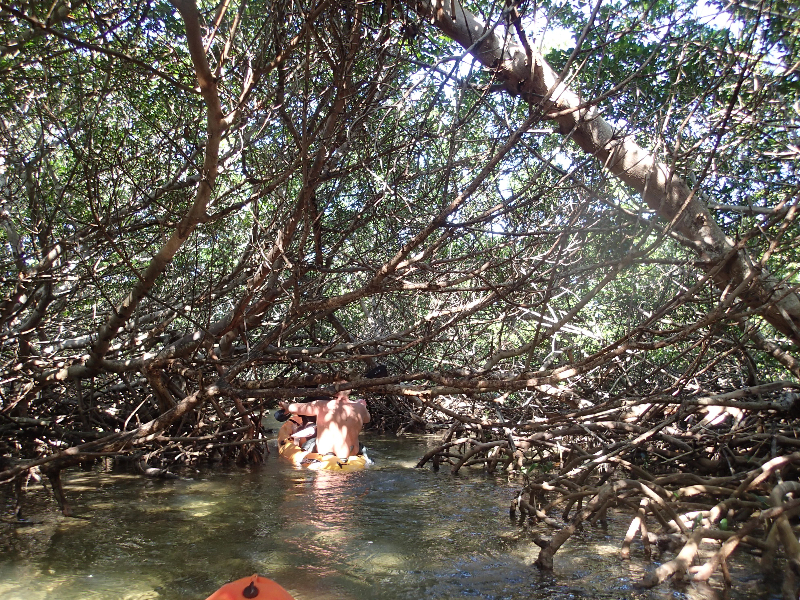 The water depth dropped to about 3 feet as we enter the mangroves. We stopped frequently to observe heron and osprey and this really cool bird, I think it was an anhinga. Regardless, these birds swim under water better than they can fly, using their wings like fins. With the full moon and high tide, there were a lot of little paths through the mangroves where we got stuck and had to back it on up. I learned that mangrove trees are actually fresh water trees that filter the salt out through their roots. Which aren't all really roots. Some are branches that hang down into the water to siphon water. Then there are sacrificial leaves that form salt crystals as it is removed from the water. Really neat if you ask me. And really cool to be surrounded by a canopy of trees in a kayak, leisurely rowing along. 4. We moved against the wind rowing back to the catamaran and the wind and current certainly had picked up. The beer didn't help and most of us had to pee pretty bad. After over an hour of kayaking, my arms were a tad on the sore side. We all made it back and relieved ourselves before popping the top on another cold one and our leisurely ride back to port. We saw a sea turtle, the dude must have been five feet long, one couple missed it, U-Turn! 5. Recognize this beach? Think Office Space. Sunset Key Island. 6. Ah the quest for a sunset. Port bow and I'm happy in 5 foot seas. Thoroughly soaked after mooring, I move aft to the boat bar. Everyone was laughing. Well, and also asking me if I enjoyed the 7 mile trip. Hell yeah! It was an awesome ride - they were all dry as could be - I. Had. Fun. Moored at North America's only reef with 4-5 foot seas, yeah, they can get in and snorkel, I'm hanging with the captain and kicking back a few cold ones followed by some rum rum rum punch. Here's a brief video before we hit the big waves and I needed both hands to hang on. 7. You cannot go any further! 8. To continue the Sloppy Joe's story (see #1)... I take you to Ernest Hemingway. You can read the full history on the official website, I'll just give you the cool little fact that I learned. 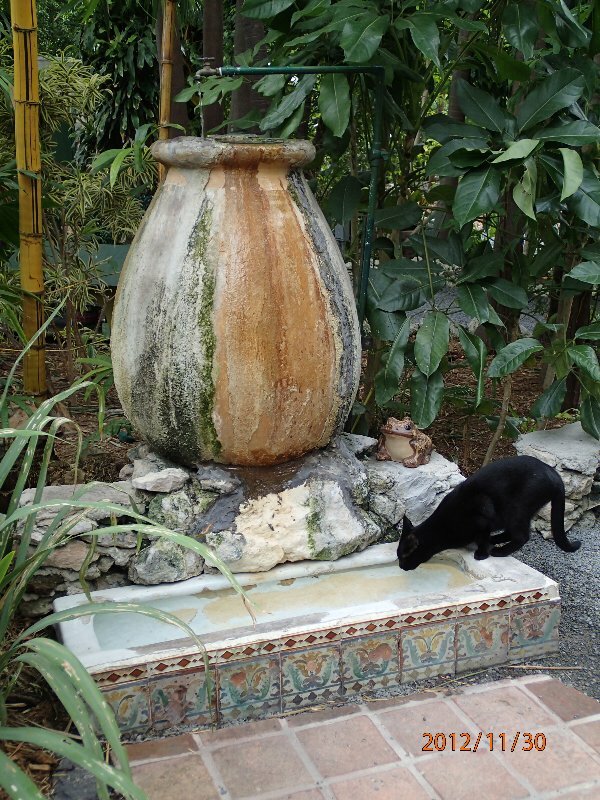 So this picture is a cat drinking fountain. Yes, I saw polydactyl cats. There are about 45 cats on the property, a little under 1/2 have 6 toes or more. Back to the story. The rumor is that after Hemingway returned from a trip as a reporter during the Spanish Civil War, he found a pool in the back yard. Upset about the extreme cost of said pool, he reportedly gave Pauline his last penny which is embedded in the flagstone pavers near the pool. But it gets better. Well, if you look closely at the "fountain" you will notice that it is a male urinal. The fountain-urinal apparently came from the original Sloppy Joe's location when Joe Russell moved the bar due to increased rent, the only thing removed from the original location that was "sort of" nailed down. Hemingway put it in the garden to "get back" at Pauline for the expensive pool. 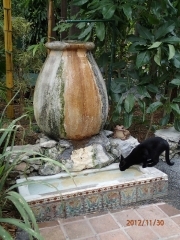 She, being the fashion diva high society woman she was, decorated it with expensive tile and found a rather large Spanish vase that would create a cat fountain. 9. Just10Bars is born. Except I didn't quite make it. Technically I made it to 10, but that's not entirely accurate. Sort of. Two are just not on the map, Coyote Ugly and a hole in the wall Cuban bar & cafe (which 2 bartenders at different joints had not heard of, and their bars were within a two minute walk from this little gem). But three of them were on Wednesday, and the rules "were" to be all in one day. So I failed, but my liver is probably thanking me. I did find out thought, that my defeat is not that bad as there are over 270 liquor licenses in the 2 mile by 4 mile island they call Key West, most of which are concentrated around Duval and Front Street. Even if I had done 10 in one day, I would not have even scratched the surface. View Pub Crawl Key West in a larger map 10. Saturday came fast, time to return to the real world. I terribly missed the kids and the dog. Key West International Airport sports the world's only beach bar. For real! There's an outdoor section next to gate 6 with sand and tables and a little boardwalk type thingy. All in the name of the tourists, oh well, it's still fun! I'll be back, but not until after I discover some new destinations. Oh, the full photo albums are available. Cheers! This entry was posted in travel and tagged Key West, sun, travel, water by mowracer. Bookmark the permalink.